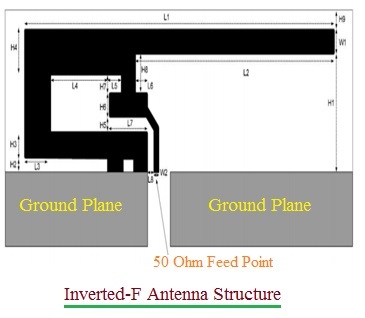 This page covers advantages and disadvantages of Inverted-F Antenna. It mentions Inverted-F Antenna advantages or benefits and Inverted-F Antenna disadvantages or drawbacks. • It is evolution of λ/4 monopole antenna. • Due to its F-shape from sideways, it is known as inverted-F antenna. • It has been implemented in many ways and known by printed inverted-F antenna, meandered printed inverted-F antenna and planar inverted-F antenna. • Due to advantages of microstrip technology its planar version has become most popular and used for wireless communication. This version is similar to any patch antenna except its F-shape. • The figure-1 depicts inverted-F antenna which can be easily etched on one side of PCB (Printed Circuit Board) along with other circuits used to mount RF components. The GND (ground) plane has been removed from underneath the antenna. • PIFA (Planar Inverted-F Antenna) functions as short circuited microstrip antenna due to its structure. ➨It is very economical as it uses same PCB used for other RF components for its fabrication. ➨The antenna is compact and small in size compare to monopole antenna. ➨It does not require any external components for impedance matching due to intermediate feed point. ➨Bandwidth of the PIFA can be adjusted by varying the size of GND plane. ➨It offers narrow bandwidth. Lengthening inverted-F antenna can provide wider bandwidth but at the cost of increase in radiation resistance. Other techniques are also employed for achieving wider bandwidth. ➨As it uses microstrip line structure for its construction, refer drawbacks of microstrip line >> as it can be applied to PIFA also. ➨Also refer advantages and disadvantages of microstrip patch antenna >> as it uses similar concepts in its design.